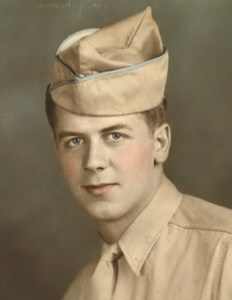 Alvin L. "Doc" Leidolf, 94, of Floyds Knobs, Indiana, passed away on Wednesday, April 10, 2019. Alvin was a United States Army veteran that proudly served his country during WWII. He retired from International Harvester and was a life-long member of St. Mary of the Knobs Catholic Church. He was born on October 23, 1924, in Floyd County, Indiana, to the late Earl and Minnie (Striegel) Leidolf. Alvin was also preceded in death by his wife, Phyllis (Fessel) Leidolf; and sisters, Vada Thomas, Ruth King, Deanna Smith, and Earlene Dean. Alvin is survived by his daughters, Suzan Didat (Regis), Jill Fischer (David), Elaine Davis (Allan), and Emily Lundy (Mark); sons, John Leidolf and Roger Leidolf; grandchildren, Regina and Rachel Didat, Justin Leidolf (Emily) and Jena Miller (J.P.), Courtney Brutscher (Barrett), Lindsey Horty (Chris), Drew Davis, Paige Martin (Josh), and Ross, Olivia, and Sarah Lundy; and seven great-grandchildren, with two more on the way. Visitation will be from 11:00 a.m. to 6:00 p.m. on Sunday, April 14, 2019, at Newcomer Cremations, Funerals & Receptions (3309 Ballard Lane, New Albany). His funeral mass will be celebrated at 11:00 a.m. on Monday at St. Mary of the Knobs Catholic Church with burial and military honors to follow in the church cemetery. Contributions in Alvin’s memory may be made to St. Mary of the Knobs Catholic Church (5719 Saint Marys Road, Floyds Knobs, IN 47119). Please consider sharing a memory of Alvin or leaving a special message for his family using the "Share Memories" section below. Add your memories to the guest book of Alvin Leidolf. Your Dad was a gift from God and I know your entire family will miss him very much. Ann and I will keep your family in our prayers. I worked with Doc when I first started as a substitute carrier at the Floyds Knobs Post Office. He was always nice to me. There was one day that I was so sick, and he came in and carried the mail for me after I sorted it. He stepped up when no one else did. Good man. Condolences to the family.